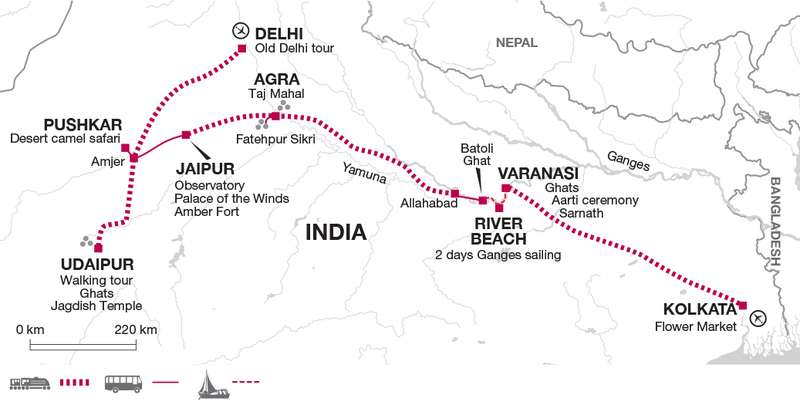 This trip covers the diverse cities and landscapes of one of the most culturally rich regions in India as we travel by train, bus and even sail on a traditional boat on the mighty Ganges. From the crowded markets and important buildings in the capital of Delhi to the historically rich Kolkata, this journey packs in a wealth of highlights. We arrive in Allahabad in Uttar Pradesh early this morning and, after a chance to freshen up in a nearby hotel, we continue by road to Batoli Ghat on the shores of the sacred Ganges. Boarding our boats in the afternoon, we then begin our two day journey to Varanasi, drifting downstream in traditional crafts towards the historic walls of Chunar Fort. Overlooking the waters of the Ganges, the fort is steeped in five centuries of Indian history, providing us with a fascinating place to stop and explore, before we continue on to our simple overnight camp on the sandy beaches that line the banks of the river. Day 15 - Arrive Kolkata. Fatehpur Sikri entrance fee 270 INR. In general only lightweight clothing is needed during the day, but bring warmer clothing for the winter evenings from mid November to mid February, (esp. December and January) when a windproof jacket and several warm layers are also recommended. Hotel heating arrangements are not on a par with UK standards and from December to February thermals may be useful. Local people may be offended by western styles of dress and brief shorts tight fitting clothing etc. should be avoided by both men and women.